Thanks for the picture of the Konigsberger Klopse. I have never made it to Laschet's for the Saturday special although have been curious about it ever since I saw that posted as a special. 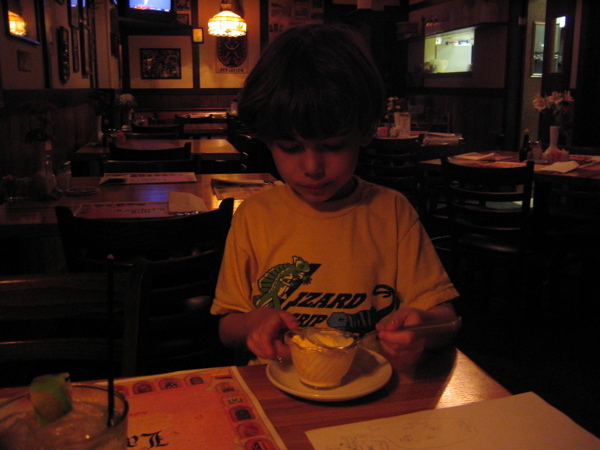 Now that I know how to use the old digital camera, I'll have to make the dish again and make a photographic record. Antonius- Thanks for the information. This dish looks so good I'm planning to try to stop by this Saturday. Just a note to memorialize a wonderful dinner last night. Together with Fra Antonio, Amata, Lucantonius, Sazerac and A2Fay, I returned for the first time in too many years to Laschet's. We split the hackpeter and, testimony to its delectability, it was gone in no time. 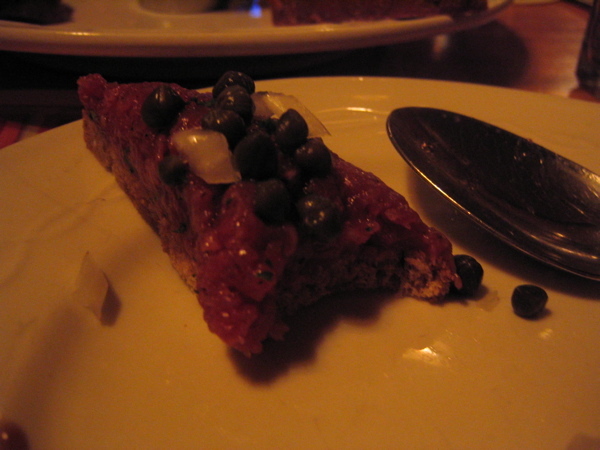 Having never had steak tartare in any of its incarnations, I was a little apprehensive. I need not have been. Served with two small cups of chopped yellow onion and tiny capers, it was a ideal Vorspeise and harbinger of things to come. Various dinners were had and enjoyed by all (though Lucantonius's choice of fries and ketchup may have most successfully ascended the peak of culinary simplicity). However, I can only speak to mine: the rouladen. The meat (stuffed with onion and dill pickle and perhaps even a little bacon) was absolutely terrific. The gravy not only complemented the meat but was perfect to dump the exceptionally good spaetzle into. The final element, the red cabbage, was the crowning touch. An excellent meal and, as I suspect is so often the case with any meal of LTH posters, surpassed only by superb conversation. I regretted having to leave after a mere three hours. To those still harboring any doubts, I encourage you to set them aside and venture forth. Markus, charming host, made us feel most welcome and provided us, unsought but most welcome, shots of the previously mentioned apple liqueur--sweet but with just enough kick. Thanks to previous posters (and Sazerac) for pushing me westward on Irving Park (and eastward to Germany) and, especially, to my companions for the evening for a genuinely delightful time. It wasn't many years for me but quite a few months since I had eaten at Laschet's and I was very happy to be back, especially with the excellent company of my family, Sazerac, A2Fay and Gypsy Boy. The food I had was up to the usual standards: the very tasty Hackepeter, a nice cup of bacon-laced bean soup and a large and delicious Wiener Schnitzel. Marcus kept me well supplied with half-litre portions of Jever and, as mentioned by Zigeuner-Jung, Marcus also offered us a round of shots on the house. I give up meat for Lent but, as happened last year, when I broke fast at Laschet's, spurning their menu of Lenten specials and allowing myself to be seduced by the allure of Hackepeter and Rouladen, once again I gave in to my base desires and partook of animal flesh, thinking that -- as I had done last year -- I could perhaps make amends through moritification of mine own flesh. But, lo and behold... Geli informed me that special dispensation had been granted! No hair-shirt, no self-thrashing with chains. Det Leben is jut. Anyway, it was a great evening in all respects. We were at Laschet's on Friday night and it was wonderful as always. German was being spoken at the bar. Tables were full. They are still on top of their game. A well deserved GNR location. The hackepeter remains our favorite anywhere. Very flavorful and even better with the capers and onions. We had the goulash as our soup and that had some nice depth and flavors (almost kidney-like tastes, which is good). We opted for hackepeter, chopped liver and the leberkase. This was the place that introduced me to leberkase, and as usual it was very tasty, although I will ask them to make the leberkase a little more browned and crispy next time. Strong to form german food. And with a liter of Optimator, how can you go wrong? The menu is a little less descriptive than I remembered especially in terms of sides and what your choices are, so in case your waitstaff doesn't explain: Choices for salads include cucumber salad and three bean salad (not just an iceberg plate). The vinegar-based potato salad has pickles and bacon (yum) or you can get the spaetzle (also very good, especially for dishes with gravy). If a dish comes with kraut you can substitute the red cabbage. A downside is no potato pancakes. You have to cross the street for those (which seems a fair arrangement that I hope keeps both places around). Resi's also has the back patio tables. Those are their two big plusses over Laschet's. We used to visit Mirabell's, but they have really slipped in quality/service over the past few years so its out of the German rotation. Back to Laschet's, Apfel schnapps on the house was a delightful end to the meal. We have heard Ursula and Franz are actively looking for buyers who will carry on the tradition. (we are pretty sure we have seen mention of this on LTH, but have heard it from elsewhere as well). No recent news on how that search is going, but among other things this prompted us to return sooner rather than later. Clearly, this jewel will be a much greater loss than Berghoff. 7650 W. Irving Park Rd. For various reasons, I haven't been able to get to Laschet's as often as I used to and certainly not as often as I'd like, but I still always realy look forward to going and, whenever I do get there, I'm not disappointed. The extraordinarily friendly service, the atmosphere, the beer and, of course, the food all keep this place one of my favourites. 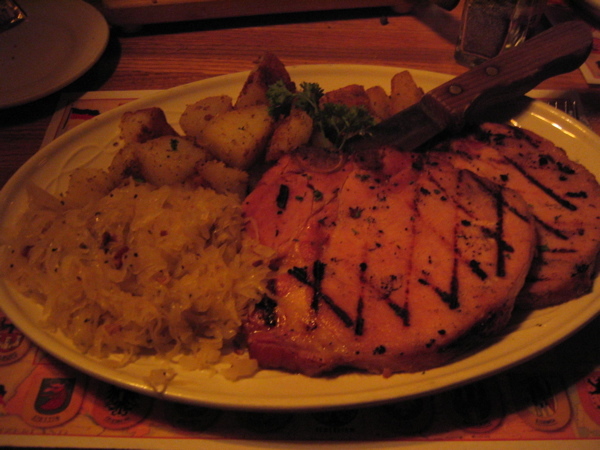 I had the Kaßler Rippchen... two large and delicious chops, served with roasted potatoes and sauerkraut, hot mustard and horseradish. I think this was the first time I had this dish at Laschet's and it was excellent -- the best version I've had in quite some time. Does anyone know where you can buy Bärenjäger retail? I haven't seen it at Binny's, which is where I usually find such things. I don't want to drive all over looking for it, but if I know someplace has it, I don't mind a bit of a journey. Several weeks ago, tLD and I finally made it to Laschet's and had a most enjoyable time. As many have commented, the hachepeter is excellent. The only negative was their liver pate, which, on that particular evening, wasn't worthy of even a second bite. I also didn't quite understand the accompanying Ritz crackers. In any case, we really enjoyed the split pea soup, cucumber salad, schnitzel, wursts, and especially the sides of spaetzle, sauerkraut, and red cabbage, and look forward to returning to enjoy their sauerbraten and rouladen. A really fine evening. The hackepeter is indeed excellent. The subtle (but obvious IMO once you realize) flavouring with the Maggi seasoning is perfect. I realized it was the Maggi seasoning (a bottle of which was on the table) when I tasted the rouladen I had ordered (also very good). Is this use a German thing or just at Laschets (or just a global thing)? I was pleasantly surprised by the very subtle curry flavor in the hackepeter. Just about the last flavor I would expect. sazerac wrote: The hackepeter is indeed excellent. The subtle (but obvious IMO once you realize) flavouring with the Maggi seasoning is perfect. Rezepten mit Maggi? Kiek mal her! * No kanguru served at Laschet's, so far as I know. The "Swiss Empire?" Isn't that an oxymoron? 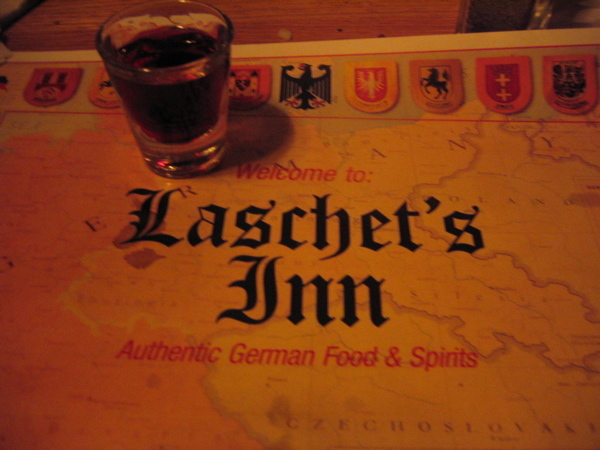 sazerac wrote: Is this use a German thing or just at Laschets (or just a global thing)? Global, Lee's Banh Mi has it for sale, right next to the "just like homemade Pickled Shrimp in their sandwich shops. Cynthia wrote: Does anyone know where you can buy Bärenjäger retail. Bärenjäger can definately be found at the Chicago location of Sam's. We bought a bottle there last week. A good friend of mine who is a regular at Laschet's informed me that Laschet's is now under new ownership. He met the new owners, a young-ish couple, the other night. No major changes have been reported as of yet. eatchicago wrote: A good friend of mine who is a regular at Laschet's informed me that Laschet's is now under new ownership. He met the new owners, a young-ish couple, the other night. I overheard the bartender explaining the change to a couple of (I assume) regulars the last time I was there (about 2 weeks ago). From what I gleamed from the bits I heard, the main cook has stayed through the ownership change. According to the bartender "nothing is going to change" re: the food. Daisy11 wrote: According to the bartender "nothing is going to change" re: the food. Excellent. Good to hear it will remain the same. Fabulous place. They also served some meatballs in mushroom sauce that were very veal-y and almost livery in taste (which we loved). The veal brat was also still very good (but they probably don't make those in house anyway). At any rate, as far as we could tell nothing has changed, so I will remain hopeful! Daisy11 wrote: From what I gleamed from the bits I heard, the main cook has stayed through the ownership change. According to the bartender "nothing is going to change" re: the food. I was there for dinner last night and not a single detail had changed, including the presence of the old owners. Please return to your regularly scheduled eating and drinking. A group of us had dinner at Laschet's on Monday night and managed to try a broad cross section of the menu. The food hasn't seemed to have slipped at all under the new owners. For me, particular standouts were the rouladen and the goulash, although the weiner schnitzel I ordered wasn't bad either. As always, the braised cabbage was simply outstanding. The weakest part of the dinner was the dessert course (apple strudel and apple crisp) which wasn't bad, it just just nothing special and was sort of an anticlimax to a great meal. I met the ever delightful Peter D for a couple of beers and a plate of fried chicken at Laschet's last evening. Laschet's was busy, though not over crowded, conversation among patrons at the bar was enjoyable, and the hackepeter and fried chicken were as good as always, in other words, very good. I did not notice any change, same bartender, same personnel, same feel to the place, they even had the little dishes of pork gribbines available. I strongly agree with GNR renewal for Laschet's. 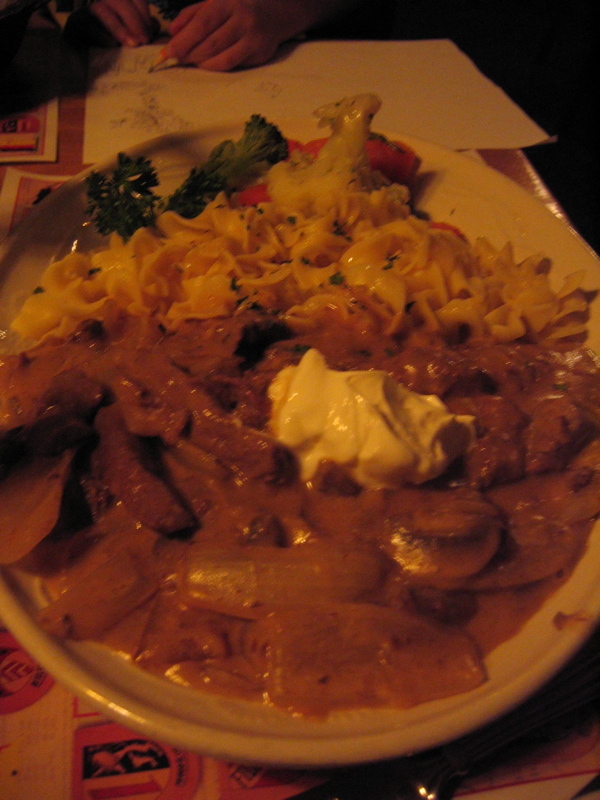 My goulash, at a recent meal was heavenly - rich, spicy, deep. As it happens, I had sampled Goulash at a hungarian place a couple of nights earlier, and it was good. But Laschet's was so much beyond that. The browning of the spatzle was done to perfection, the selection of beers excellent. The wait staff seemed new - two engaging Asian women was not something I had seen before at Laschet's - but otherwise it seemed pretty unchanged, which is very good indeed. Last edited by dicksond on March 23rd, 2007, 9:55 am, edited 1 time in total. Our dinner started with one of the most delicious cream of chicken soups of recent memory. The rouladen was the best I have ever sampled, tender but by no means mush. My chicken paprikasch was excellent and the gravy a perfect accompaniment to the too rarely on my menu spaetzle. I can't believe I've driven past this place so many times with no notice. That will not happen again. My only complaint is that they don't open until 2:00 on the weekdays! This morning I had one of those aha moments - I suddenly got it. Fortunately this happens only rarely, and no one was hurt this time. I was catching up on an old issue of the Trib's Good Eats and the cover article happened to be about Gastropubs. There was this somewhat tortured discussion about the "invention" and "discovery" of gastropubs, and how they were coming to Chicago. There also was an even more pointless discussion of the pros and cons of the word, and the article made a point of identifying which of the specific places mentioned in the article considered it to be acceptable to be called a gastropub, and which did not. No disrespect meant to the Trib, btw. This particular discourse is not terribly dissimilar to many conversations that occur here, and I have happily engaged in my share. But I was thinking, "this seems really stupid - it can't be unique or new that someone decides to cook good food in a place that also serves good beer," and then it hit me. This is what much of Middle Europe, Canada, Ireland, Belgium, the Indian subcontinent and many other parts of the world (maybe even most of the world) would just call a restaurant. Good food, primarily paired with good beer, what a concept. And it was not much of a leap from there to realize that the article had skipped, because it did not fit its anglo-centric thesis that a "Gastropub" is a new concept that was born in the 90's in the UK, what is probably the best and one of the older Gastropubs in Chicago, Laschet's. Hey, I have nothing against England, really, or the Trib, and I like the word Gastropub just fine, though I would agree it is more utilitarian than elegant, but a new phenomenon it ain't. All hail Laschet's, Chicago's Gastropub par excellence! FWIW, my response to the "outrage" at the word Gastropub has almost invariably been a ~shrug.~ I'm with you that's it's an imprecise word to describe a place that serves beer and good food. And Laschet's, using the term loosely, certainly fits that bill. Laschet's is also a good neighborhood option for takeout. Lots of food, travels well (though I live relatively nearby). We ate at Laschet's on April 1 but I was too full to post that night! Still, I hope that their GNR renewal is not in jeopardy. We were happy to see that the place was full, an especially good sign for a Sunday night. Everything was atleast as good as it was under the previous owners. The hackepater was in rare form. Tasty and bright red. Certainly fresh meat, and beautifully seasoned with a kick of Maggi. The goulash was also excellent, with some nice tender chunks of meat and a rich paprika based soup with some depth. The dinner salad was a cut above with fresh mixed greens and crumbled bleu cheese. Griffin had the duck which is a sunday night special (well its an off-menu special they have on sundays but not "the" daily special). I had the roast veal. The duck was fine (tasty if just a tad less done than we like), but the veal and its accompanying spaetzle were sublime. The veal was tender, juicy and flavorful (the slices of roast veal are suprisingly dark and look a bit like a pork roast). The spaetzle were perfectly browned from pan frying, with a hint of nutmeg. A nice new addition that we don't recall previously were pan fried potatoes that came with the duck. They were also soft and nicely browned. Other friends had the wienerschnitzel and the chicken schnitzel with zwei ei. This was our friends second visit in two weeks, and they concur that the place hasn't missed a step in transition. I was also very happy that my beloved Optimator was still on tap. Prost! And here's to 40 more years under new ownership!